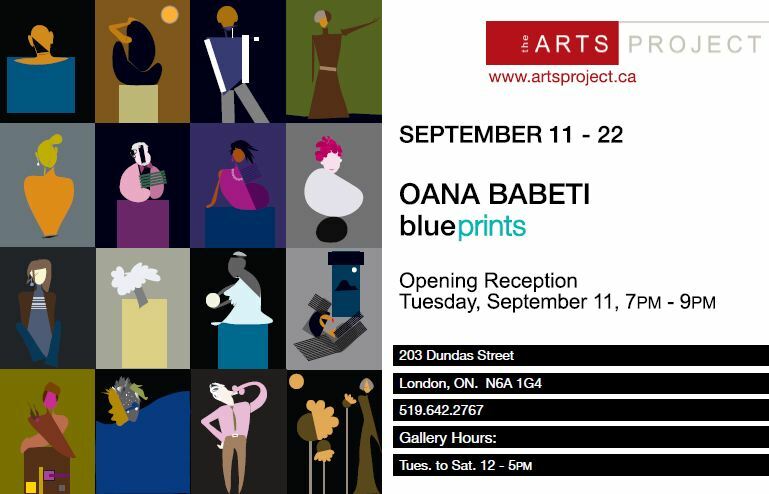 We invite you to the opening reception of Oana Babeti’s new art show, Blueprints, which will take place at The Arts Project in London, Ontario on September 11th, 7-9pm. The show will be on display September 11 to 22. The idea of this exhibition emerged two years ago while I was drafting a friend’s logo. I was drawing his minimalistic portrait, trying to incorporate it into my project, when… all of a sudden, I realized that I forgot what my initial intention was. I was playing with my perception of him. That was the beginning. A year later, my series of portraits came to contain over a hundred pieces representing various people – family members, friends, acquaintances, people that I met only once, or never. The portraits were the result of a complex and intimate meditation about those people’s presence, personality, look and style… A flickering perception triggers the understanding of my character’s nature, just a few seconds before I start drawing them. These fifteen digital art pieces pursue expressions of the intensity of life in a variety of styles, which make room for enjoyment and contemplation. I envision these images as generative art forms that can be printed on various materials – from paper to fabric, ceramic, etc. Oana Babeti is a London, Ontario artist who was educated in the United States and Romania, her degrees including a Bachelor in Fine Arts (Textile Design) from Fashion Institute of Technology, State University of New York and a Stage and Costume Design degree from the University of Fine Arts, Bucharest, Romania. She exhibited at various galleries in New York City (East-West Gallery, Gallery@49, Jacob Javits Convention Center) and Romania (Dominus Gallery, Museum of Art). Her artworks are displayed in private collections in Canada, France, Germany, Israel, Italy, Romania, the United Kingdom, and the United States. Her book illustrations and covers have appeared in print over the past decade. Over the years she has done stage and costume designs for various productions in New York City at La Mama Theater, Kitchen Theater, Manhattan Theater Source, etc. For the past three years she has been working as a freelance textile designer for HUE, Kayser-Roth Corporation in New York City. She is also the owner and fashion stylist of Wanna B Fashion Styling (London, Ontario).